Can you tell us a little about your business and how you created it? I am a weaver and my business is called Laura’s Loom, based in Sedbergh where I have recently opened a workshop at 16 Back Lane. I learned to weave while living and working in the USA but it was a visit as a child to an old cotton mill in Lancashire that initially fired my imagination and interest in weaving. For many years weaving was a hobby while I worked as a Geographic Information Systems Analyst for the Department of Environmental Management in Boston, Massachusetts. Both interests require a love of small details and precision so I can see some parallels between my former professional life and my new life as a weaver! Interestingly, both interests have been inspired by a love of the outdoors, landscape, nature and a desire help protect the environment. I love throwing the shuttle. Weaving is hard work but when I get into a rhythm it’s a wonderfully calming process. I am lucky to have a space to work at home as well as a workshop in town and from both places I have fabulous views of the Howgills and the dale which heads towards Dent. 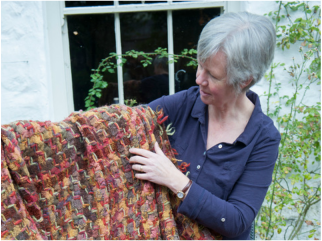 Watching the sun cross the face of Holme Fell inspired a piece of weaving which became a throw. Closely observing a dry stone wall inspired me to weave a beautiful silk scarf! My palette is clearly defined by the colours of the Dales and my textures are heavily influenced by the walls which criss-cross our landscape. Laura’s Loom is not just a handweaving business. A few years ago I started to source wool from local farms and began to investigate how I could turn this into a commercially viable product that celebrated and promoted British wool. I now work with commercial spinners, weavers, dyers and cloth finishers, all based in the north of England or the Scottish Borders, to produce an annual collection of blankets and scarves from wool which I collect from Yorkshire Dales-based farmers, most of them farming within ten miles of Sedbergh. We produce some fabulous wool here, useful for all sorts of products. I’ve recently added wool walking socks to my inventory! To blow away the cobwebs, climb to the top of The Calf in the Howgills. For something a bit more gentle, follow the river paths along the River Rawthey. In both places, sit a while, drink in the views and listen to the peace and utter tranquility. For lovely lunches I would highly recommend Smatts Duo and The Three Hares, two cafes in Sedbergh, which also sell fabulous home-made cakes and breads. On a rainy day you can’t beat a wander around Farfield Mill, especially at the weekend when the big old looms are usually clacking away. Any day is a good on to visit the ancient Quaker Meeting House at Brigflatts. 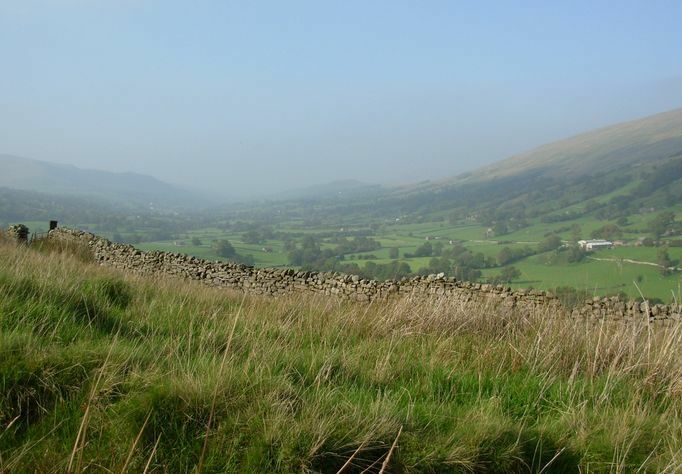 Is there anywhere in the Yorkshire Dales you feel sudden swooping joy? I don’t have to go far to find this, just across the river, over the golf course, and up on to the small road that crosses the common land of Holme Fell. There’s hardly ever anyone up there. If you want even more joy then climb the fell to the top where you’ll find a small tarn and can see not only all of Sedbergh but over into Barbondale and Dentdale too. What do you think is the happy detail in everyday life that many of us miss? The tiny objects that sprinkle the ground beneath our feet. Get down on your knees or your belly and take a close look at nature’s tiny details - mosses, lichens, tiny flowers, little insects, rocks. They’re fascinating! Cautley Spout, about half way up (because it’s such hard work climbing to the top!) There’s a rock you can sit on to look back down the valley, following the ribbon of stream to where it joins the river. My neighbours - reliable, helpful, kind people, they are the salt of the earth and have looked after us “off-comers” ever since we arrived, making us feel welcome in a small community, which is not always an easy transition. The area around the Howgills is one of the darkest parts of the UK. When you’re here, make sure to stay up and watch the stars at night. While you’re out you might also see bats flitting around and hear the almost silent whoosh of an owl as it flies past.